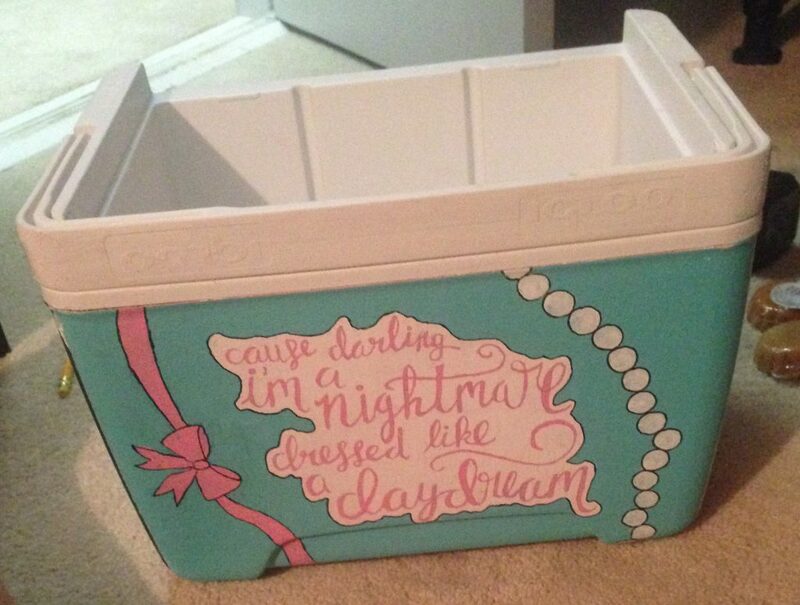 Today’s post isn’t about something that’s incredibly relevant to me personally right now, but given that it’s about to be fraternity formal season back home and I often have friends coming to me with questions about coolers, I figured it’d be an appropriate topic to write about. 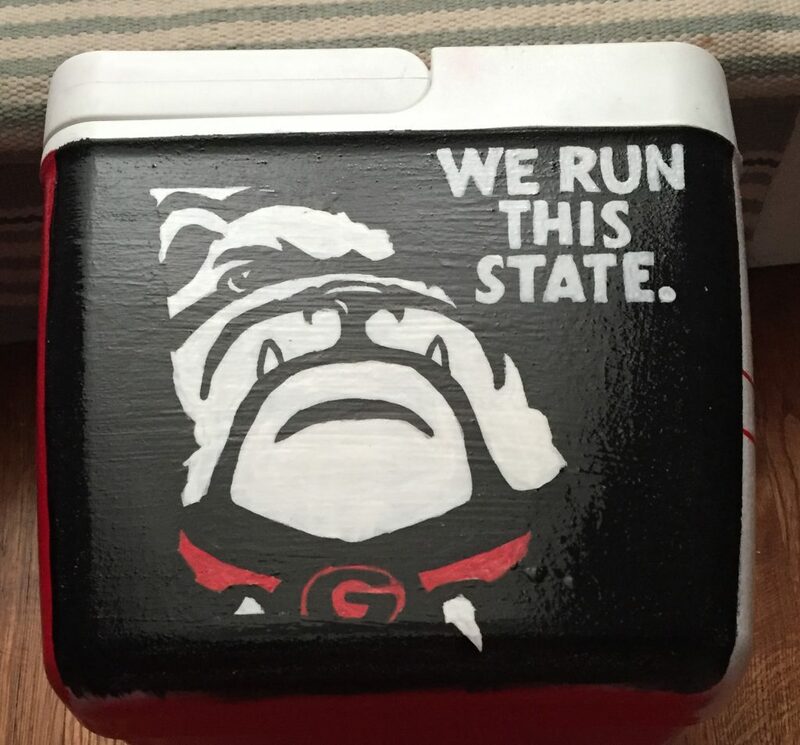 There’s a number of posts about painting coolers (and endless Facebook groups), but I figured I’d share some of my collected wisdom over the 6 or so coolers I’ve painted in recent years. I like to think I’ve struck a nice balance that allows me to put in the minimum amount of effort while still creating a cooler that’ll hold up decently well and look nice. 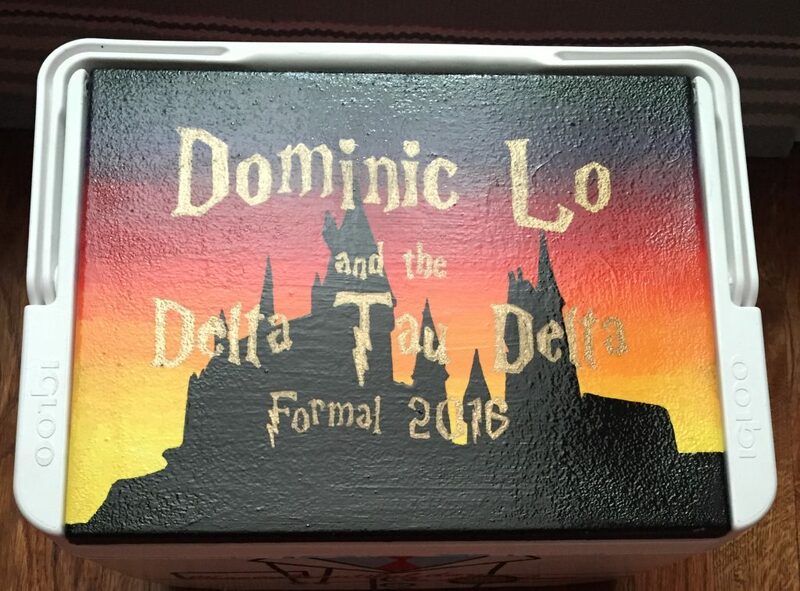 For those of you unfamiliar with the concept, it’s a tradition among most southern US universities that, when a girl is invited on a guy’s fraternity formal, she paints him a cooler. It’s kind of a thank you for the fact that the guy is essentially paying for your entire weekend in another city. First of all, pick a cooler that’s relatively devoid of any indented logos and textures. The less you have to fill in, the better. However, if your cooler of choice has some indents in it, fill them in with Bondo. It’s a filler designed for cars (so it’s a bit more effective than the more common choice of Spackle). However, *major warning* do this step outside. I don’t care if you’re in a dorm room and don’t want to drag the cooler down a ton of stairs. This stuff is incredibly potent and if you’re somehow stupid enough to do it inside despite the instructions, you may or may not give yourself chemical poisoning and pass out twice in the middle of the dorm hallway the next morning. I definitely don’t speak from experience or anything. The next step in priming is sanding. Get an electric sander for this because sanding by hand is the biggest waste of time and the most painful arm workout. I generally do this in two steps: one with 60-grit paper and one with 150+-grit. The first gets the shiny layer off the cooler (which is crucial for making sure the primer/paint stick), and the second smooths it. Then, go in with a spray primer. Krylon makes the best ones – just make sure you pick one specifically designed for plastic. When in doubt, school spirit is always a safe choice. Ah, the fun part. Or so you’d think. It’s also arguably the most stressful. It’s best to go in with a clear idea of what you want to paint, although this is certainly easier if you know the guy pretty well. If not, stalk him on Facebook/Instagram/Twitter (as if you probably haven’t already) and see what he’s into. 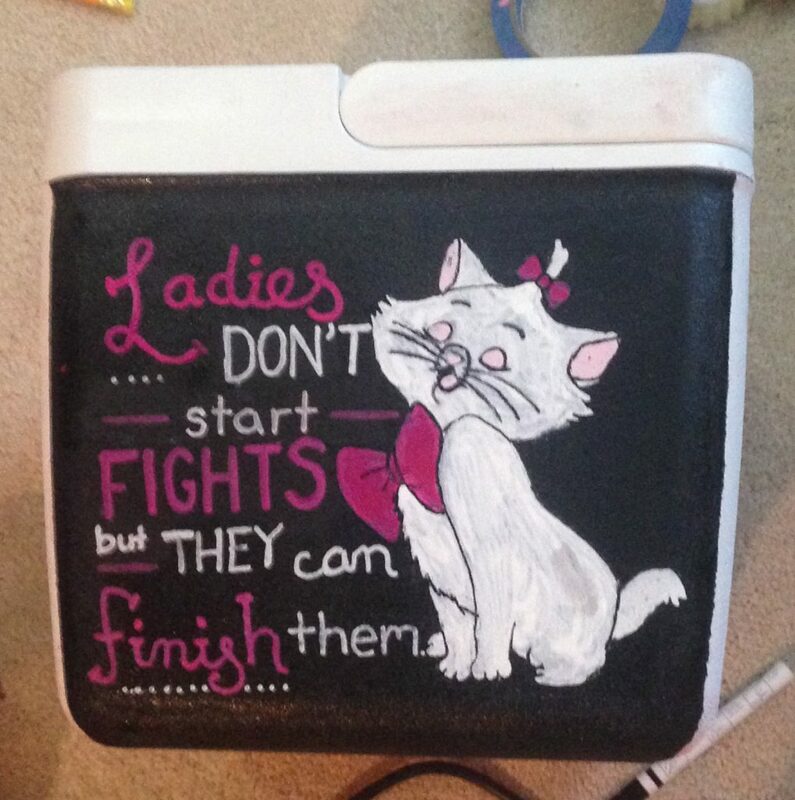 This also applies if you’re just painting a cooler for yourself or a friend or your family. Pick your sides and go for it. As the lazy person I am, I generally prefer painting solid backgrounds and then doing any sort of designs on top of that, rather than making the background intricate as well. When it comes to the actual painting, there’s two methods you can go with: tracing and free-handing. I’ve done both – the first cooler I did (the larger one) was mostly traced, while the second one was entirely free-handed, with the exception of using straight edges to ensure that my lines were even. Ultimately, the free-handed one looked pretty close to if it had been traced, and took way less time. If you think you can pull off free-handing, it saves a ton of time in the long run. I actually don’t even have a consistent method for this – it kind of depends on what materials I have available. However, my most preferred method is a few coats of outdoor Mod Podge, followed by a coat or two of polycrylic, and then a spray coat of polyurethane. It’s pretty durable and only ends up taking a day or two to add all the coats and let them dry fully. My biggest tip for protecting your new masterpiece from getting damaged? Threaten that boy’s life if he decides to treat your hard work with reckless disregard. I’m only somewhat joking. It’s pretty effective. 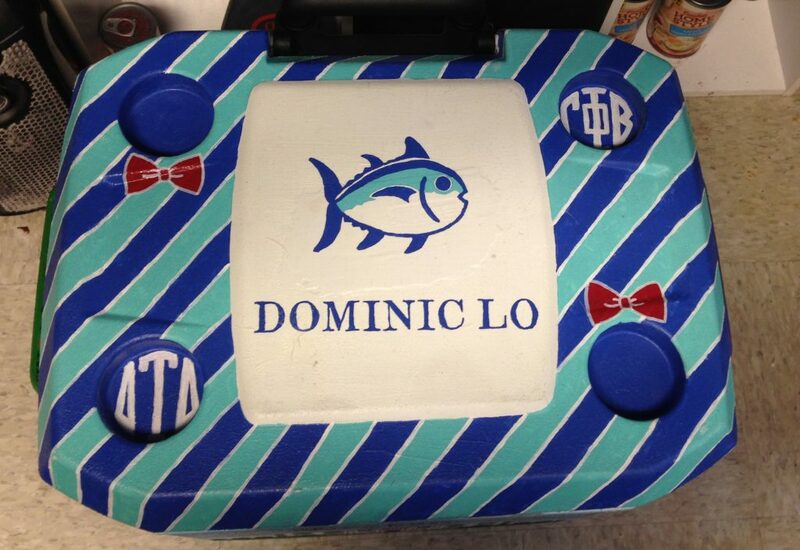 This is probably the most #srat that this blog has ever been, and probably the most that it ever will be. In any case, I hope this is helpful. This is actually super helpful! Thank you!